It is built upon the foundation that our experiences are powerful reflections of not only who we are but how we interface with others….key in the never-ending quest for finding Mr. or Ms. Right. It is a safe place for people to learn, laugh, grow and, through sharing personal experiences, know, what they do and do not want in a partner. “I am so excited with the overwhelming response to BadOnlineDates.com but not surprised. Dating is the one topic that everyone can relate to regardless of race, religion, nationality, economics or even sexual orientation,” said Kelton, who conceived the idea for BadOnlineDates.com while writing her reality-based dating and mating book Don’t Use My Sweater Like A Towel. ViewDate.com is the the world’s first website to offer online speed dating services. It allows users to see and speak to each other in real time over the Internet, and a full-fledged profile, search and messaging system lets them keep in touch between events. This new site is currently invitation-only. It is also equipped with a special filtering technology prevents the “meat market” effect where some women are inundated with countless unwanted messages, and an advanced network architecture ensures that the video stream is smooth and uninterrupted. Connie Jinq, ViewDate’s founder, started ViewDate after hearing feedback from frustrated friends who had tried traditional speed dates and online dating. Both seemed promising, but fundamentally flawed. She realized that these flaws could make meaningful relationships difficult to foster. and worked hard to ensure that we’re not only the first, but far and away the best,” said Jing. WealthyMen.com is a new online dating site that appears to be designed specifically for gold digging women and guys who canâ€™t score a date despite being rich. I like to believe this is the online reincarnation of the shallow reality TV show Who Wants to Marry a Multi-Millionaire? Qualifications? Well, all interested men should make at least a hundred grand a year to become a member. Too bad, you canâ€™t fake it because they use various patented methods of verifying the income, profession, and photographs of their subscribers. On the other hand, women of all income levels can easily sign up and get a chance to date these rich guys. Just like ordinary dating sites, members need to create seductive profiles and members can communicate on-site and through e-mails. Affiliate marketers will surely love this good news! 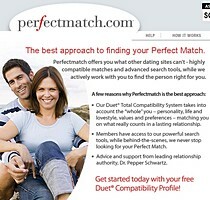 Online dating and relationship site Perfectmatch.com incorporated Commission Junction‘s CJ Associate affiliate service into its integrated marketing efforts to cost effectively build its brand and continue to improve its customer acquisition efficiencies. This resulted to an impressive 300% jump in affiliate sales in the past 18 months with even greater upside for next 12-24 months. “Commission Junction has also delivered a truly integrated marketing approach by leveraging our extensive offline movie and TV initiatives to drive the most traffic to our Web site. With the assistance of Commission Junction and the building of our brand over the past two years, our affiliate program revenue has increased by 300% since implementation of CJ Associate in December 2005,” said Perfectmatch Founder/Chief Executive Officer Duane Dahl. Match.com today announced the launch of MatchMobile. Starting today, millions of its members won’t have to wait to hear from a potential date or mate. Members can receive free text alerts when someone winks or emails, and also search the entire Match.com relationship network, all from their cell phone.